For our volunteers it is never too late to add to our knowledge and our four days spent recently at the University of East Anglia (UEA) is a good example of this. Over four days we dabbled in Ecology and the Environment, Thermal Dynamics and Water Dynamics. Firstly, the ecology bit. 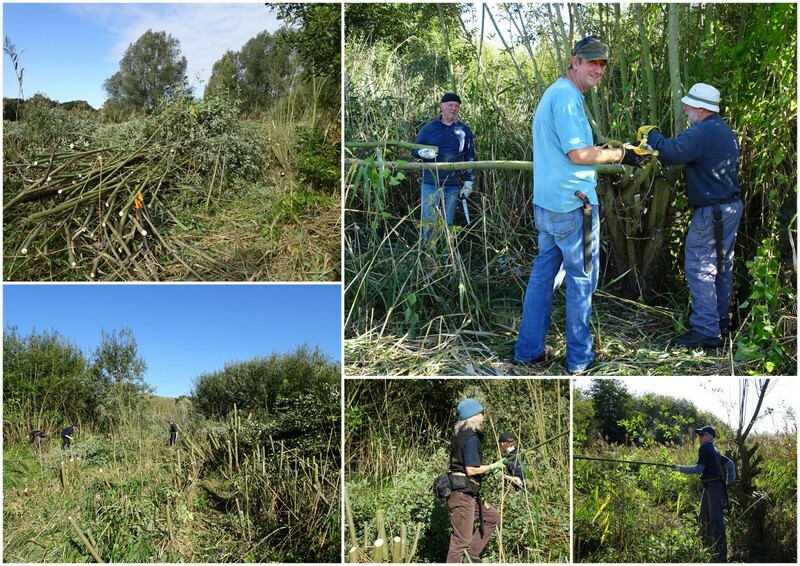 We were at the UEA to clear willow scrub from an area of fen next to the boardwalk which runs alongside the River Yare. The fen area is a mixture of reed and sedge, very tall and dense with patches of bindweed to stitch it all together. It was difficult to walk through but fortunately dry underfoot because of the hot summer. The willow was striving to take over the area and needed to be cleared before it changed the habitat of the fen. A team walkabout identified what we needed to do and how to do it. We split into two groups each tackling a section of the willow. 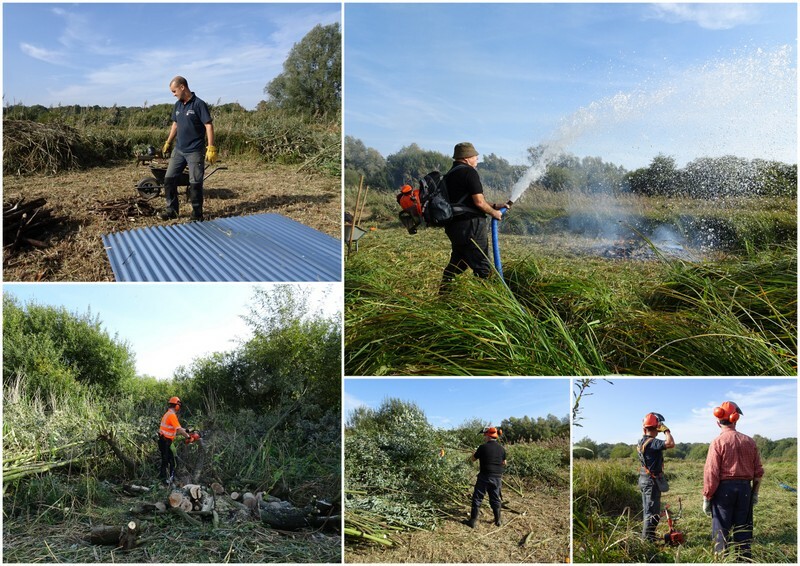 Robert, with brush cutter, was tasked with clearing an area suitable for burning the scrub – a difficult job because of the density of the reed and unevenness of the ground. We set to work cutting back the willow. Much of it was a lot more than scrub having grown to over 15 feet. This was cut and stacked ready for burning. The Water Dynamics experience: We couldn’t have a bonfire on our first day because the Reed was tinder dry with a high risk of fire spreading across the fen. On the second and subsequent days we had a water pump and a long hose, so we could pump water from the river and dampen-down the area around the fire site before we started. The pump was also run occasionally during the day to keep the area wet. At the end of each day the fire was put out by giving it a good soaking. Our volunteers soon got used to handling the hose and had a bit of fun with this. The Thermal Dynamics bit: To protect the fen we built our fire on sheets of corrugated metal. The fires were quick to get going but these had to be managed to contain them within the bounds of the four sheets of tin. This meant we had to limit how much material we put on the fire and also the size of this. 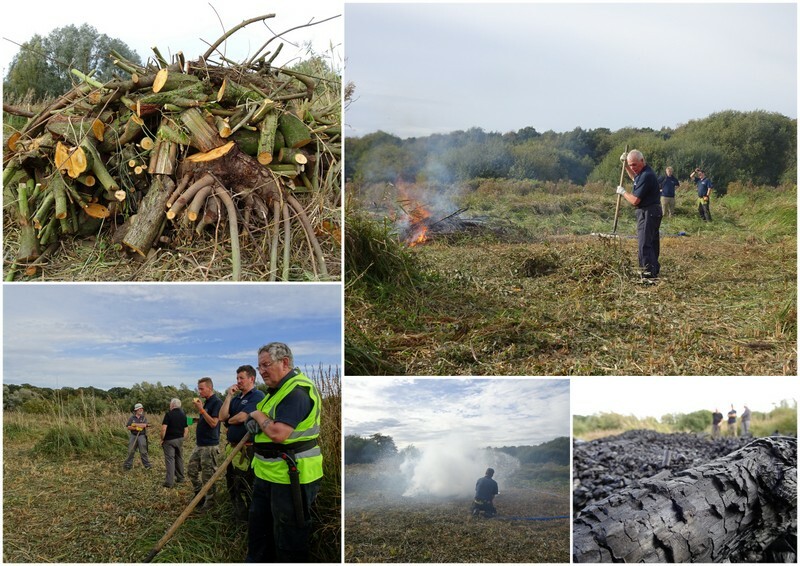 Over a period of three days we had burned a lot of willow but had not processed all of the scrub cut by our volunteers. Another visit beckons to finish off. Perhaps we should have a graduation ceremony as part of our Christmas celebrations.